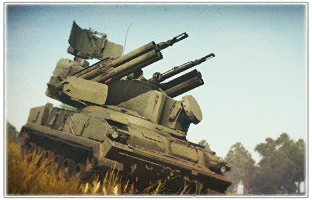 The ZPRK 2S6 "Tunguska" is a rank VII Russian self-propelled anti-aircraft gun with a battle rating of 10.0 (AB/RB/SB). It was introduced in Update 1.87 "Locked On". The ZPRK 2S6 armor consists of 9 mm rolled homogeneous plates for the hull and turret. Although mostly flat surfaces, it's armor can be angled to provide an average of 30mm of effective thickness which can protect against .50 cal machine guns in most places of the hull. The turret is extremely vulnerable to all types of fire at any angle. The crew consists a commander, gunner, loader, and driver. Three out of the four crew members are situated in the turret sitting right next to each other. This makes the ZPRK 2S6 extremely prone to destroyed by "crew knocked out" if hit in the turret. The ZPRK 2S6 provides good mobility with it's 628 horsepower ChtZ V-46-2s1 engine allowing for a max speed of 65km/h in ideal conditions. Under realistic testing conditions it tops around 37 km/h in flat grassy areas. This is the same with its reverse speed. 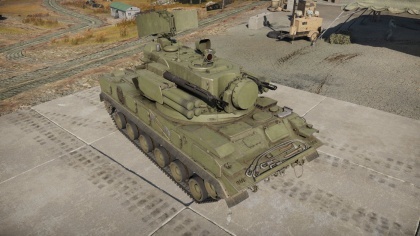 The ZPRK 2S6 Tunguska is equipped with a 1RL144 search and separate tracking radar; with the search radar mounted on top of the turret at the rear and the tracking radar located at the front of the the turret. The radar system is capable of tracking a target while scanning, but can only track targets within a 180° arc from the front of the turret. Describe the tactics of playing in the vehicle, the features of using vehicles in the team and advice on tactics. Refrain from creating a "guide" - do not impose a single point of view but instead give the reader food for thought. Describe the most dangerous enemies and give recommendations on fighting them. If necessary, note the specifics of the game in different modes (AB, RB, SB). Defensible against light tanks, possibly against heavier ones with it's missiles. Although the ZSU-23-4 Shilka had successfully proven its capabilities in the numerous conflicts it took part in, its shortcomings were ever increasingly coming to light as well. While faster and more capable aircraft and helicopters were being developed, the Shilka was quickly becoming obsolete, with its very short engagement range and radar detection limiting its AA capabilities greatly. Thus, in 1970, Soviet engineers began developing a replacement for the venerable Shilka. The new vehicle, codenamed “Tunguska”, was designed with a pair of 30mm autocannons coupled to advanced tracking and targeting systems. In addition, the decision was made to also install surface-to-air guided missiles, as the targeting systems for both cannons and missiles turned out to be conveniently very similar, and was expected to greatly bolster the capabilities of the Tunguska. By 1973, the Tunguska was considered ready. In the mid ‘70s, however, with the introduction of a Soviet mobile missile-only AA unit, which performed a similar role as the Tunguska, further development and production of the Tunguska was put in question. In the end, realizing the greater flexibility and potential of the Tunguska design, further development and production was approved. A pre-production batch left the factory floor in 1976 for army trials. After a long series of tests, the Tunguska was officially commissioned into service with the Soviet Army in September 1982. The vehicle was continuously being improved upon, with subsequent newer variants being developed during the 1990s and 2000s. The Tunguska served initially with the Soviet armed forces, although it was passed on to the militaries of the Soviet Union’s successor states after its collapse in the late 1980s. Thus, modernized versions of the Tunguska continue to serve with the Russian armed forces today as well as the armies of Belarus and Ukraine. The Tunguska also sees service with other nations around the world, such as Yemen, India, Morocco and some others. This page was last edited on 24 April 2019, at 16:05.